Canals are recognised as having been critical for the development of many ancient civilisations and are also evidence for the engineering capabilities of these early societies. Recent discoveries(a) in the Peruvian Andes revealed canals over 5,400 years old. Canals in the capital city of Atlantis are described by Plato in great detail but with dimensions that are quite unrealistic. One possible explanation for this; the whole story is fiction and the dimensions were just pulled out of thin air. However, if Plato or anyone had been writing fiction you would expect such details to be closer to reality. In fact Plato expresses incredulity at these dimensions but notes them as a record of Solon’s report. This adds weight to the theory that the numbers had been transcribed erroneously from the original Egyptian sources or the units of measurements were misunderstood. To my mind the extent of the irrigation canals recorded by Plato would seem to suggest that the Plain of Atlantis was subject to a dry climate. The dimensions might be that of a natural feature adapted to suit the needs of a fortified harbour. 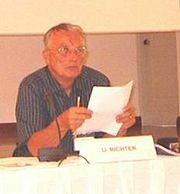 The latter idea has been proposed and expanded on by Ulf Richter(e). Extensive ancient canal systems have been identified in both North and South America. John Jensen has discovered one such network in the Louisiana region(a), but has had the good sense not to try to associate it with Atlantis. Jensen’s site also deals with canals in Mexico and Africa. His claim regarding the Louisiana canals has been challenged online(c) and as of March 2016 his own website is offline. However, in early 2017 Jensen published another paper on the Migration-Diffusion website(d) about ancient canals, which includes a reference to the ancient canals on the US Atlantic and Gulf coasts, also dated to the 6th millennium BC. Further information regarding the Mexican pre-Colombian irrigation systems is available on the Ancient Origins website(b). Peter James in opposing the idea of a Minoan explanation points out that no canal systems have been discovered on Crete or Thera.